After a quick online search, I decided to make an intriguing risotto recipe with one of the squash that the lone man’s hands had carefully fostered. As I stirred with a patient hand, the golden flecks of squash melting in the heat, my soul was soothed. The aromatic finished dish was perfect and creamy, as lush and colorful as the deepest hues of autumn — exactly what I needed on that blustery day. From that moment, my passion for squash seemed limitless, and I sought to cook with all varieties, from the slender yellow or green, thin-skinned summer squash to the heavy and bulbous winter varieties like red kuri, its rugged orange skin meant for winter preservation. The possibilities are truly endless thanks to squash’s versatility. In my recently published book, Smitten with Squash, I showcase 75 recipes that let readers meet the golden children of the Cucurbit family, summer and winter squash. Although the botanical names of plant families can be difficult to keep track of as well as pronounce, understanding their backgrounds can be helpful in learning how to identify them. The Cucurbit family, commonly referred to as the gourd family, includes cucumbers, melons, chayotes, and pumpkins as well as over a hundred varieties of squash in three different families: Cucurbita maxima, Cucurbita moschata, and Cucurbita pepo. They have beautiful long, flowing vines that trail along the ground, providing protection for the roots of the annual plants. Spiraled tendrils and leaves resembling tiny hearts bring the fruit to life in sunny yellow flowers that hold the power of the mighty and curvaceous squash that will evolve. While we commonly refer to them as vegetables, squash are actually a fruit because they contain seeds. Squash is considered a monumental vegetable in many historians’ eyes, as it is presumed to be the plant that graduated hunters and gatherers to growers. Dustings of 12,000-year-old Cucurbita seeds were found in the caves of Ecuador, and much of its history is rooted in southern Mexico. Domestication of other crops such as corn and beans didn’t begin until four thousand years later, which speaks to Cucurbita’s importance in the food chain. Over ten thousand years, the plants gradually migrated north with native populations. Cultivation became widespread as people discovered that when squash were grown with corn and beans, all three thrived. Referred to as the “Three Sisters” of Indian agriculture, they became the first form of intercropping. Native Americans discovered that the tall, straight stalks of corn were just right for the climbing vines of the beans, whose roots captured nitrogen from the air, enriching the soil for the corn. The large squash leaves covered the ground, protecting and shading the shallow roots. It may be thousands of years later, but Midwest farmers are still using this same technique to bring us a bountiful harvest—a testament to its brilliance. Every year I wait for the “Jolly Green Giant” Brussels sprouts stalks to appear at the market. For many people they’re a “love or hate 'em” kind of vegetable, and coincidentally squash can be the same way. I couldn’t resist sautéing the two together in an orange butter glaze to turn skeptics into believers. Bold flavors and textures come from local honey, pecans, and a hefty dose of black pepper, resulting in a side dish that begs for a place on your Thanksgiving table. If you’re a carnivore at heart, some crispy, crumbled bacon stirred in at the end is a divine addition. Serves 4–5 as a side dish. Stir together glaze ingredients and set aside. In a large skillet, heat 1 tablespoon olive oil over medium heat. Swirl to coat pan, then add squash. Stir the squash pieces so they are coated with oil and sprinkle with 1 teaspoon salt. Shake pan so squash spreads out in an even layer and let cook, without stirring, so that pieces brown a bit on one side, about 6 to 8 minutes. Stir and spread the pieces out again and let cook, without stirring, until the other side is browned, about 8 minutes. Stir contents and shake pan, cooking until squash pierces easily with a fork but still holds its shape. Remove from heat and pour into a bowl. In the same pan, heat remaining tablespoon of oil over medium-high heat. 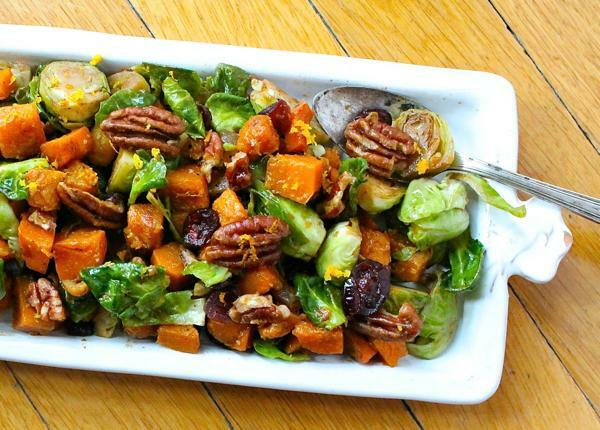 When the oil is very hot, place Brussels sprouts cut side down in pan, sprinkling with salt. Reduce heat to medium, and sear on one side until nicely browned, about 3 minutes. Turn over Brussels sprouts and cook the other side until browned and tender, 3 to 5 minutes. Some of the leaves that have fallen loose will be dark brown or charred, but don’t toss them. They’re so good! Reduce heat to low and add squash back to the pan, along with pecans and cranberries. Stir in the glaze to coat all ingredients, then cook for a few minutes, until warmed through. 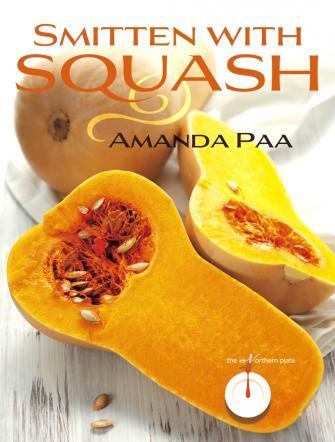 Reprinted with permission from Smitten with Squash by Amanda Kay Paa, published by Minnesota Historical Society Press. 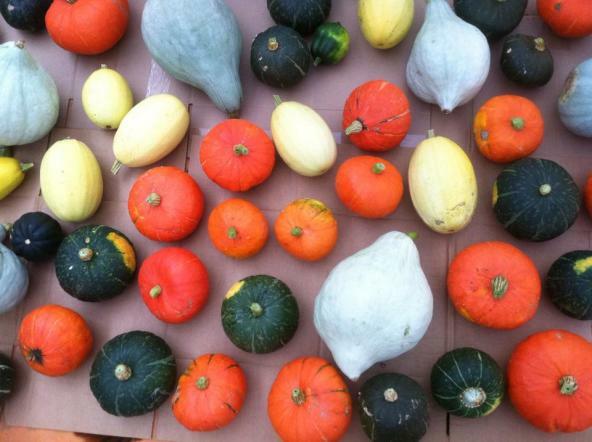 Want more of Amanda's delicious squash recipes and insights? Come join her at the St. Paul Farmers Market this Saturday from 9am - noon, where she'll be answering squash questions and Smitten with Squash will be for sale. Also keep a lookout for her class at Cooks of Crocus Hill, with registration announced on October 1st. 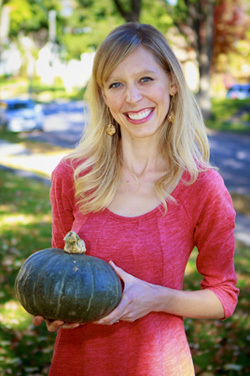 Amanda Kay Paa is author of Smitten with Squash, a book with delicious recipes that highlight the joy of squash from sweet to savory, breakfast to dessert, inspired by myriad cultural cuisines. She is also author of the popular blog Heartbeet Kitchen.